located in the Kantō region of the island of Honshu. The capital is the city of Saitama.
. Saitama - Entries of this BLOG .
. Chichibu Night Festival (Chichibu Yomatsuri 秩父夜祭) .
. Kawagoe Daruma Market 川越だるま . 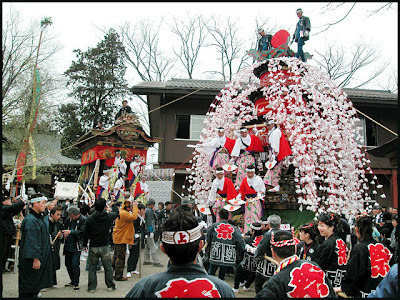 Chichibu Yomatsuri is a festival of Chichibu Shrine which has a history of more than 2,000 years. It is one of Japan's three greatest hikiyama (float) festivals, together with the Gion Matsuri of Kyoto (July 1st-31st) and the Takayama Matsuri of Takayama City, Gifu Prefecture (April 14th and 15th, and October 9th and 10th). 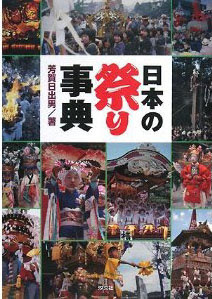 The main attraction of this festival takes place on the 3rd (the 2nd features an event held on the eve called Yoiyama). 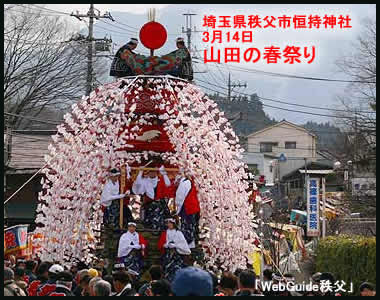 Two kasaboko floats which are large parasol-like objects decorated on top with weapons such as spears, and artificial flowers together with four yatai floats shaped like small houses are paraded through the city streets. In the afternoon, the floats are transformed into stages by pulling out wings on either side, where Kabuki plays are performed. The most exciting scene of the festival unfolds on the evening of the 3rd when kasaboko and yatai floats, weighing 10-20 tons each and lit up with countless lanterns, climb up a steep slope with a mikoshi (a portable shrine). The spectators' excitement reaches its peak at the powerful sound of the drums and flutes, and the unique festival shouts of 'Ho-ryai! Ho-ryai!' The fireworks illuminating the clear winter evening skies are another of the attractions of this festival. The Deity Myooken is celebrated. It is believed Myoken Bosatsu, the goddess of Chichibu Shrine, and the dragon god of Mount Buko meet once a year at a site called Otabijo -- literally, "a place of pilgrimage" -- symbolizing Horai, where the fruit of immortality is said to grow, on Dec. 3. The pair are supposed to meet at Kame-no-ko Ishi (Tortoise Stone). The tortoise symbolizes the earth (the goddess) and the dragon god symbolizes the sky. 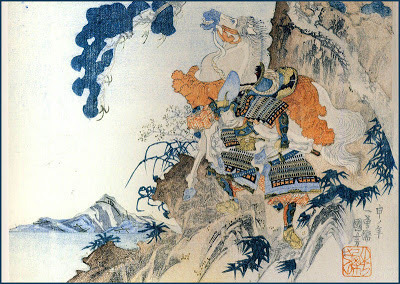 was a samurai who fought in the Genpei War, in Japan. Originally fighting for the Taira clan, he switched sides for the battle of Dan-no-ura, and ended the war on the winning side. Following the war, when his son Shigeyasu was killed by Hōjō Tokimasa, Shigetada spoke up. The reward for this temerity was death, along with the rest of his family. His brave attempt to defend his honor, along with various other acts of strength and skill are recorded in the Heike Monogatari and other chronicles of the period.
. WKD : Wrestling (sumo, sumoo 相撲) .